The hostel is in a reallyyyy old house, but has a good location! The bedroom and the kitchen is okay, the bathroom is weird and so old! For Vienna the price was affordable, but at the time of my stay the bedroom smells, it's not that nice that we have to walk that much to be able to enter in our bedrooms, the host was quite nice. Péssimo atendimento de recepção! Ñ conseguem seguir nem mesmo os horários estipulados para atendimento aos hóspedes. Mal cheiro e nenhuma manutenção da cozinha/banheiros. Enfim, o q salva(???) é a localização. Without a doubt the worst hostel I have ever been to. Neither does location help so much trouble. The hostel has an old structure and the staff did not help at all. I had to take my backpack at 4:00 in the luggage room and my bus was only 00:00 because I had to withdraw or I could not get my luggage. Not worth the price. It is better to invest a little more and stay in something better. 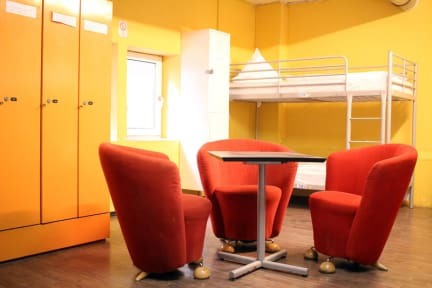 O hostel é horrível.O quarto que fiquei fica em outro endereço diferente da recepção,quando cheguei no local certo eu abri a porta de acesso (porta da rua) e já era um corredor grande com varias beliches dos dois lados tudo muito bagunçado,sujo e abafado sem nenhuma janela. Banheiros muito sujos e 3 duchas para aprox. 30hóspedes.Fiquei no local 3 dias por falta de opção e nenhum desses dias foi feita limpeza.A cozinha fica em frente ao banheiro e não tem nenhuma estrutura (dish).Não recomendo! The worst hostel experience of my entire life. I made my reservation online and when I arrived they told me that it was cancelled. suddenly the women at the reception made make another reservation online and pay another amount of cash. the hostel localization was different from the site and the floor was old and it had holes. the bathroom was also bad because the shower only had two options, freezing or extremely hot and the windows were broken. I sincerely don´t recommend this.